Thank you all for stopping by today. 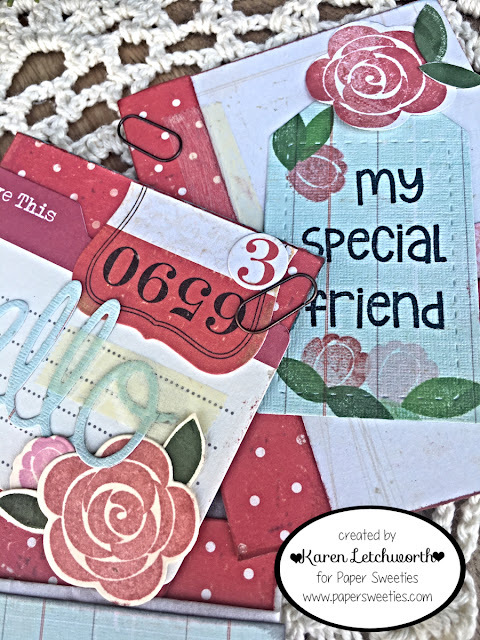 I'm excited to share this fun project with you that I created for Joy Clair Stamps to showcase some of new Joy Clair Stamp Sets...and some of the old favorites. I really enjoyed making the Pie Box Project I posted on April 2 as Joy Clair Stamps celebrates the Month of April with The Cutting Cafe and all their amazing cutting files. I had originally planned on making one of the adorable boxes found in the Lip Balm/Chapstick Holder Set from The Cutting Cafe; but because I had some computer/printer problems this month (as I've been whining about lately...LOL) I decided on the Pie Box Project that I already had put together. Subsequently, I ended up "piecing together" my own Chapstick holder with some of their cuts; but it's not 100% the Cutting Cafe version because I couldn't print all the pieces I needed. Please...don't get me started on that awful printer again. Anyway, here's a look at what I put together to share with you today using my fabulous Joy Clair Stamps. 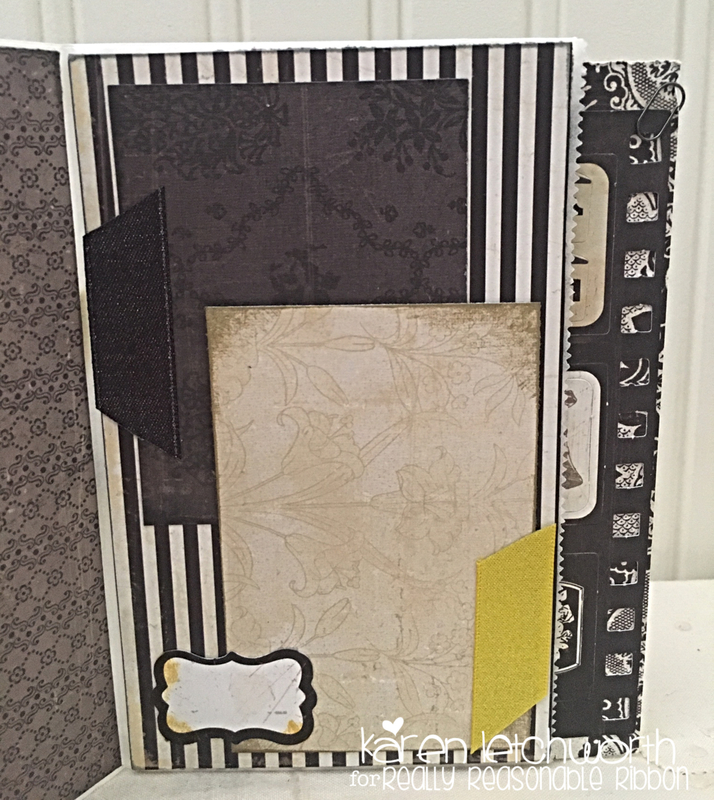 The patterned papers and border stickers are from the Crate Paper Farmhouse line. I did some machine stitching, added a tiny rusty paper clip, and some natural burlap string. 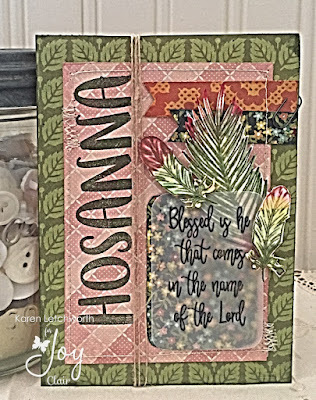 The words/sentiments on my card (Hosanna and the longer sentiment) are found in the new Hosanna Stamp Set, and the longer sentiment was stamped onto a piece of vellum and laid over the calico patterned paper. 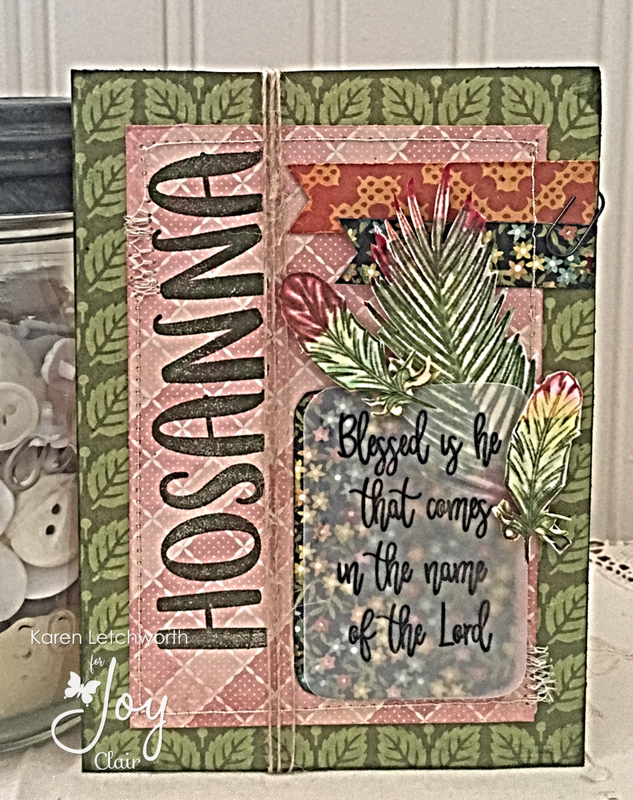 I stamped the feathers in Marmalade, Broken Glass, Brick Red, and Green Grass Tim Holtz Distress Inks. 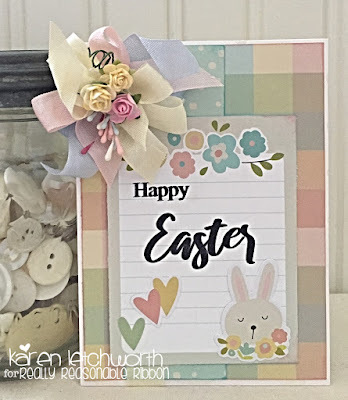 The word (Hello) that I hung on a tag from my Chapstick holder is from the Easter Greetings Stamp Set. I just adore all the little sentiments in each set, and I use them often. Then, I made a matching card using two sentiments and the large feather from the gorgeous new Hosanna Stamp Set; as well as a smaller feather found in the new Unashamed Stamp Set. 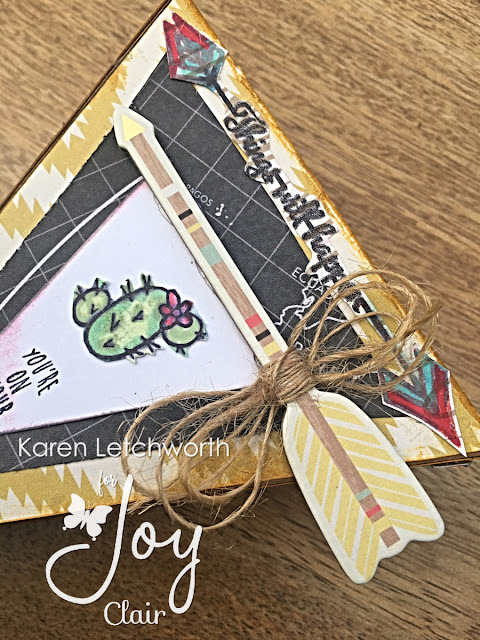 All of the stamps found at Joy Clair work together to compliment one another so well; and this helps you to make the very most of your stamp purchases. How much do you LOVE these gorgeous Joy Clair Stamps? I hope you enjoy them as much as I (and all my teammates) do, and that you will treat yourself to something new. We're always here to help if you have any questions. 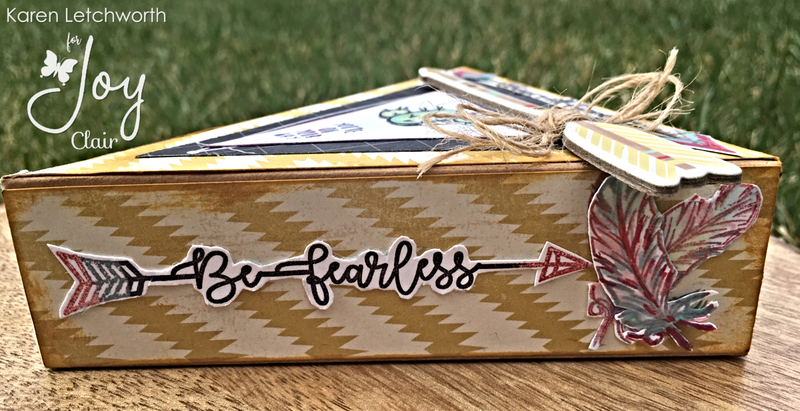 It's that bittersweet time of the month when we wrap up all the amazing fun, excitement, and inspiration that's been taking place at Paper Sweeties since we first revealed the new Hello Stamp Set and Hello Sweet Cuts with you just a few days ago. 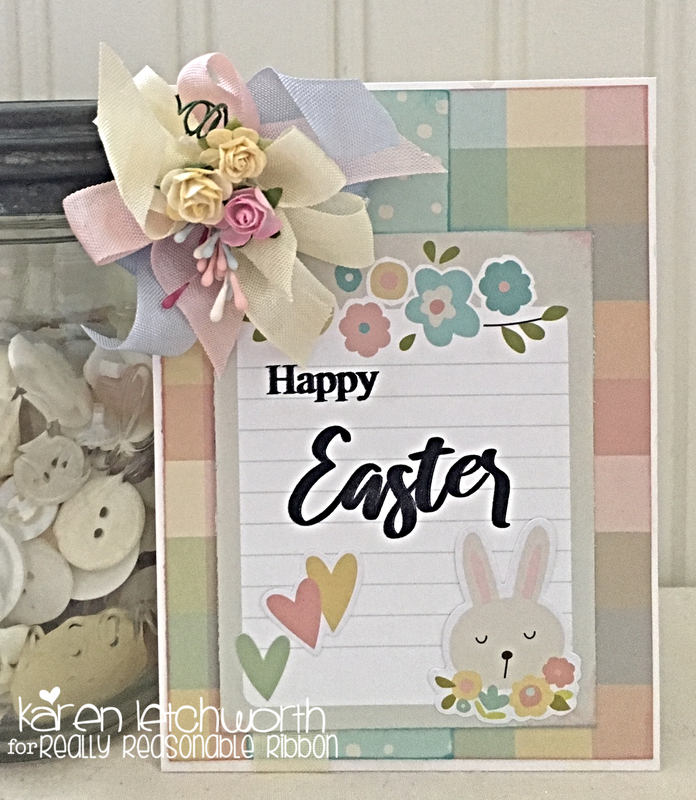 I hope you were inspired by all that you saw; and if you missed any of these fabulous projects, just click on the links to the three days of posts (Sunday, Monday and today) from myself and all of my Paper Sweeties teammates.....that's a whole lot of amazing inspiration. And you won't want to miss all the creative ways this fabulous new set can be used. Here's what I came up with to share with you all today. 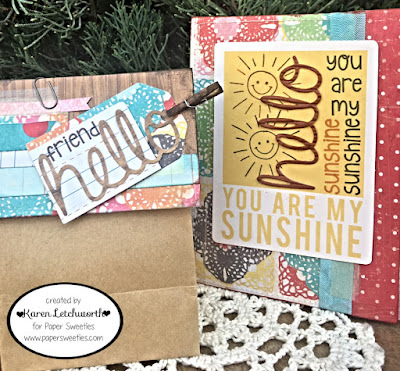 I used a small glassine bag, folded it upwards and covered it with patterned papers from a line called Emma's Shoppe by Crate Paper (an all-time favorite of mine) to create a pocket album. 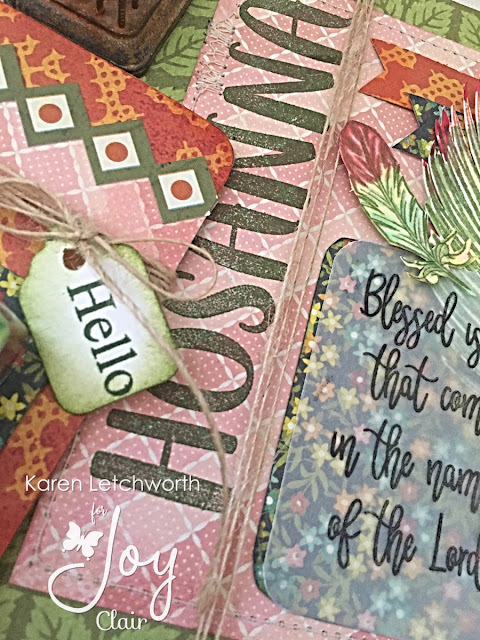 I stamped the cover with sentiments and images (flowers) found in the new Hello Stamp Set, and I die-cut the word HELLO using the new Hello Sweet Cuts as a sentiment on one of my inside tags. There are actually two tags tucked into this little pocket album. The second tag has the larger flower stamped on it, as well as the words "my special friend". I enjoyed using the gorgeous flowers and leaves in this sweet new set, and also enjoyed exploring the fun ways to use all the different words in this awesome new stamp set. By the way, glassine bags are always a fun way to make little photo and journalling books where you can store treasured memories. 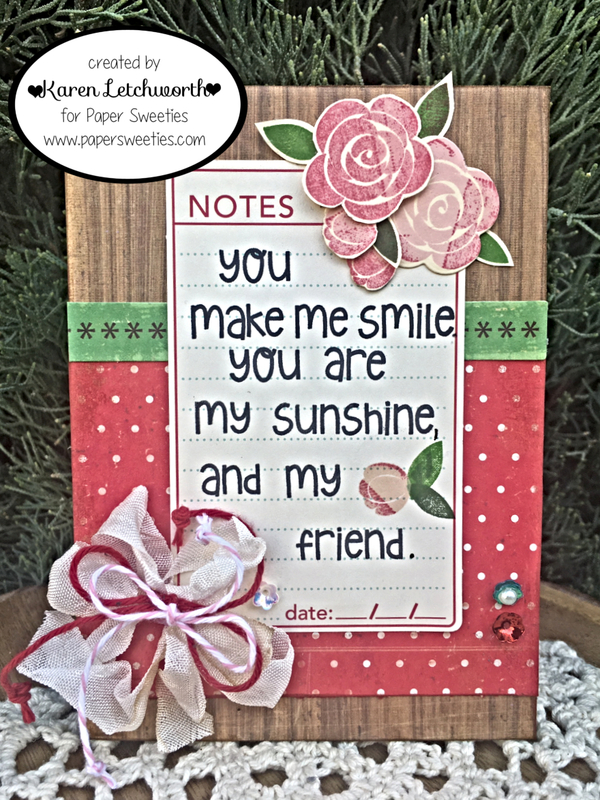 Paper Sweeties makes it easy to decorate all your cards, mini albums, planners and so much more. Here's the list of all my Paper Sweeties teammates who are sharing a project with you today. I know they will inspire you with something that will make you decide to pick up this FABULOUS new set from Paper Sweeties for yourself. Thanks again for stopping by today. Welcome back to my little old blog today, friends! I'm so glad you're here again today (and I'm very grateful that you're here). Every comment I received means so much to me. 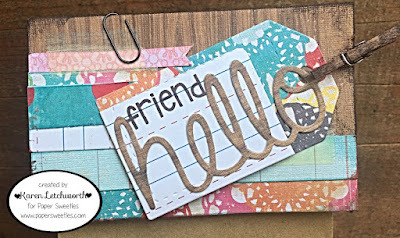 I hope you saw my first card using this sweet new Hello Stamp Set from Paper Sweeties; but if you missed it, you can see it here by using this link to my Sneak Peek Card which posted yesterday. 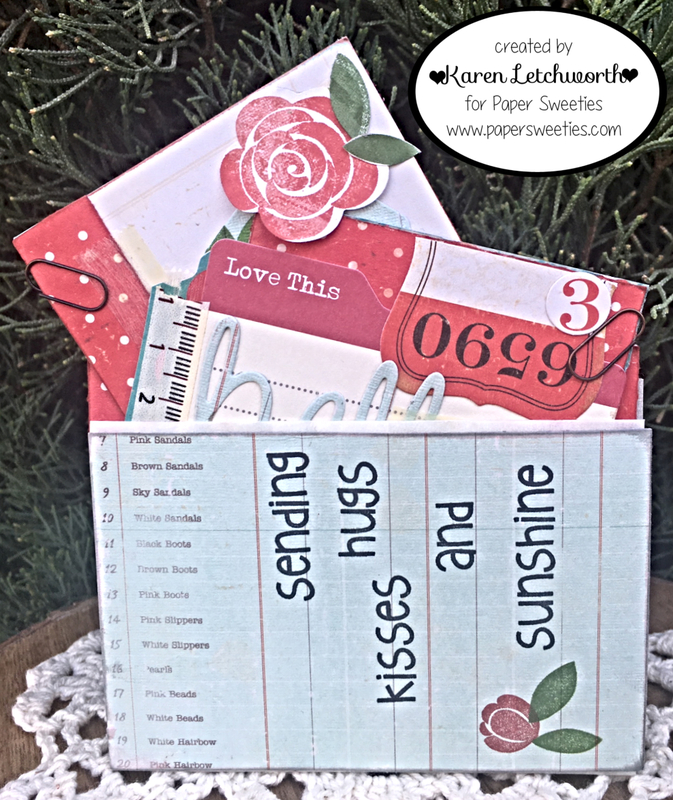 For today's post I'm sharing two projects as we celebrate Release Day at Paper Sweeties. I'm sharing this cute little treat bag filled with candies, and topped with a cute tag from the Sweet Cuts Stitched Tags #1 along with some scraps of patterned papers, a tea-stained mini clothespin, and the darling HELLO from the new Hello Sweet Cuts...as well as the stamped word (friend) from the new Hello Stamp Set. 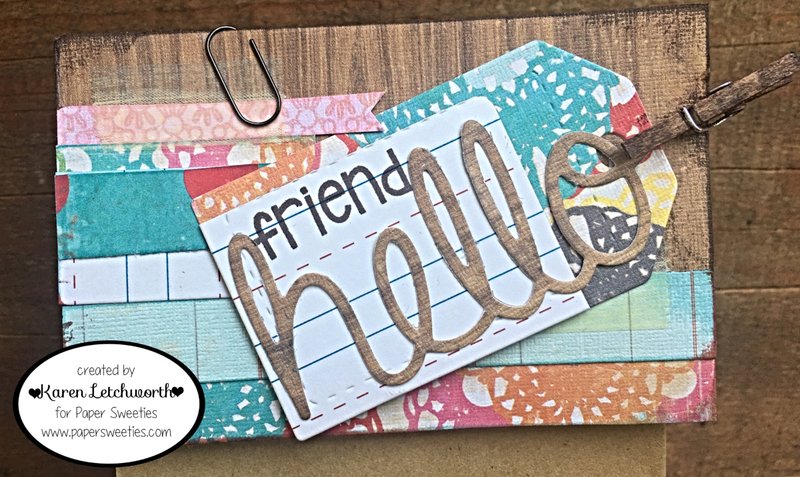 Then, I created a fun card again using the AWESOME new Hello Stamp Set to really show off that fabulous Hello Sweet Cut just one more time. 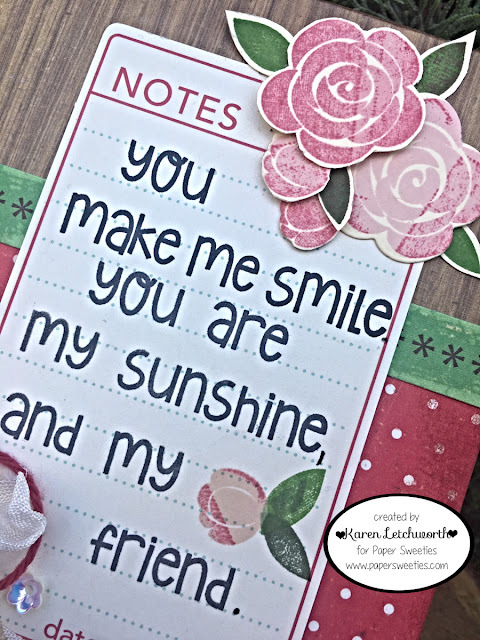 I'm really trying to make more cards that can be easily mailed (flatter cards in general), and Paper Sweeties has such cute stamps/sentiments and images, that they can be the star of your cards..... and this will help keep them flat enough to mail. 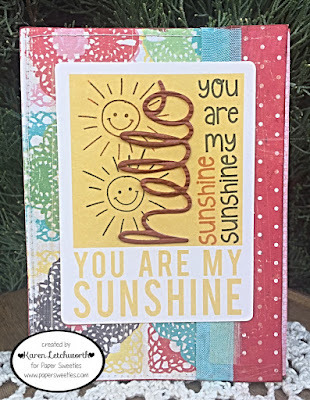 These stamps look SO cute on this card with those adorable sentiments/words (you are my) stamped facing in a different direction than the stamped words (sunshine sunshine).....and then having the die-cut word (Hello) cut from a corrugated paper gives yet another texture to the sentiment card. 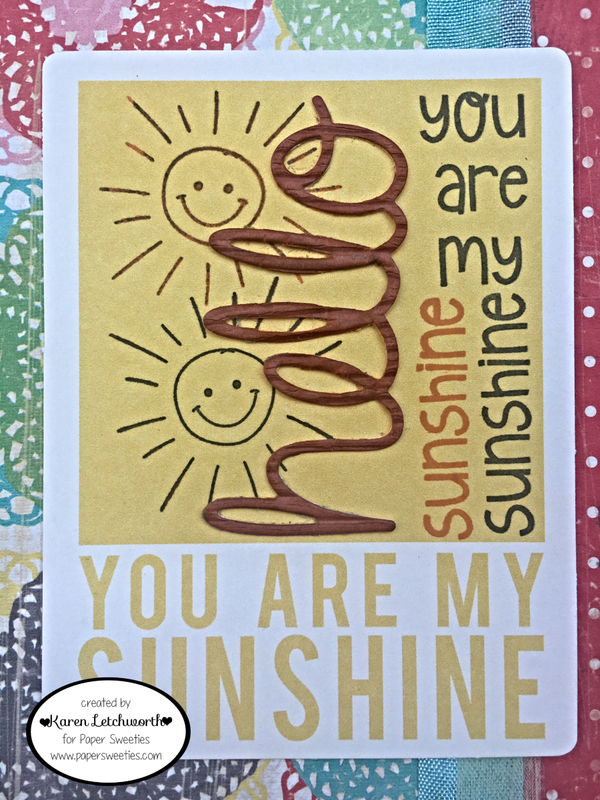 The OA journalling card I used coincidentally had the same words already printed on it (you are my sunshine) so that worked out nicely. 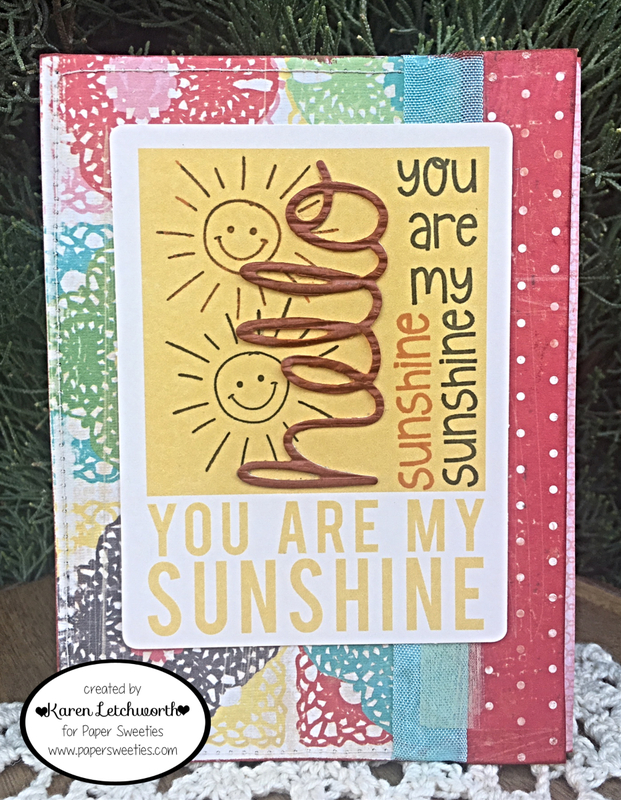 The sunshine happy face that I stamped twice (once in black and once in orange/red) can be found in the Somewhere Over The Rainbow Stamp Set. There are so many fabulous stamp sets available at Paper Sweeties, and they all work together to compliment one another. You will also see that I wrapped a nice long length of Robin Egg Seam Binding around my card to add color and texture. There's just cuteness everywhere at Paper Sweeties. 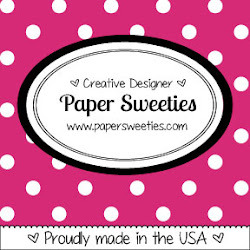 Come by, and see what's happening this month at Paper Sweeties. Welcome by my blog today, friends. 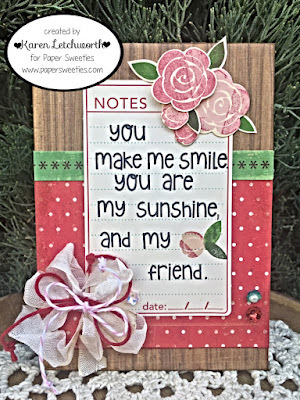 I'm posting a super sweet card today that I created for the Sneak Peek at the April Release from Paper Sweeties. This darling new sentiment set is going to be another must-have for every stampers' collection. 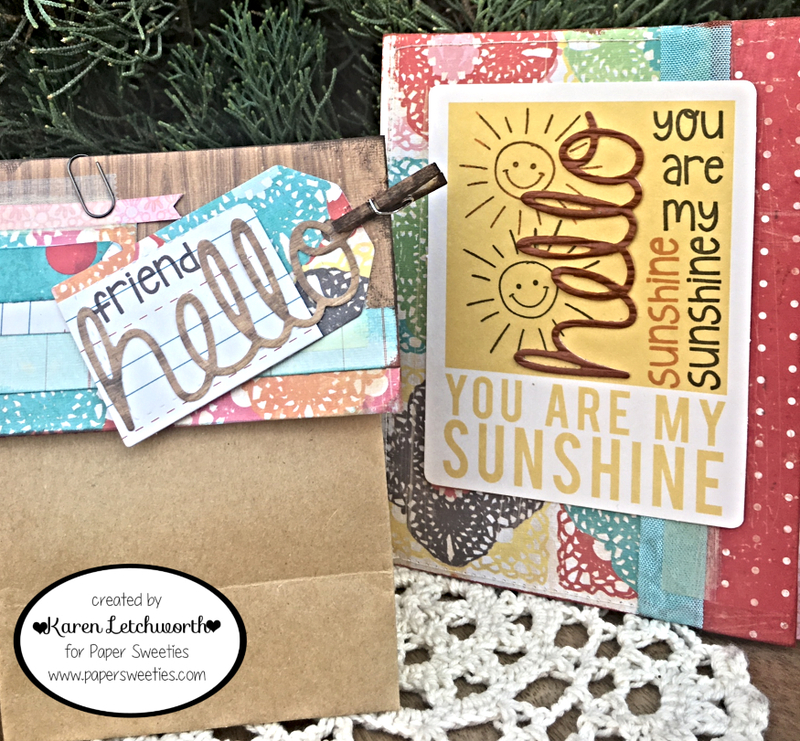 I sure had fun playing with the new Hello Stamp Set to create this sweet and simple card....I really wanted to use several of the different words as well as the images found in this set to create my card. 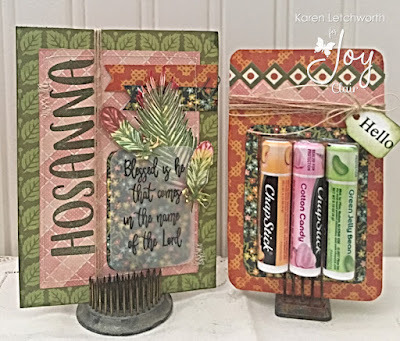 I stamped the sentiments (words) onto a lined OA journalling card, and I also stamped the flowers and leaves found in the new Hello Stamp Set, and used the coordinating Hello Sweet Cuts to cut them and and layer them back together with 3-D Foam Tabs. The brand new Hello Stamp Set is really the BIG STAR on this card. The finishing touches include a double bow tied with lengths of Frosting Seam Binding, lengths of Baker's Twine, and some Strawberry Sequins, Green Apple Sequins and Marshmallow Sequins. This is a very simple card. The patterned papers and border sticker are from Emma's Shoppe by Crate Paper. 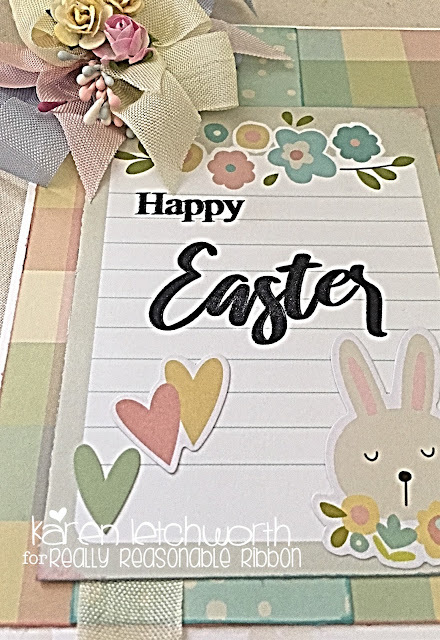 With Paper Sweeties' wonderful stamps and sweet cuts, you can make cards that go from super simple to amazingly adorable, and will fit with any style of patterned papers. I really try keep my posts (and photos) very discreet on "Sneak Peek" Day so that I leave a little bit of suspense as to what's to come. You won't want to miss inspiration from any of the posts today, tomorrow and Tuesday. And....treat yourself to something extra sweet from Paper Sweeties - Lots of luscious wrinkled seam binding, flower-shaped sequins, embellishments, and all things OH, SO cute await you each day at Paper Sweeties, and we're always happy to have you stop by. Here's the list of all my talented teammates from Paper Sweeties who have prepared something special for you today. By clicking on their names, you will be taken directly to each blog. Thanks again for visiting me today and leaving me some love, too. Hello! 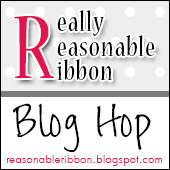 Welcome by the Really Reasonable Ribbon April Blog Hop. 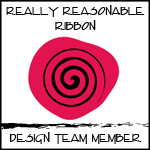 You should have arrived here by way of Cheryl's Blog; but if not, you can get caught up quickly by visiting the Really Reasonable Ribbon Blog for all the details. 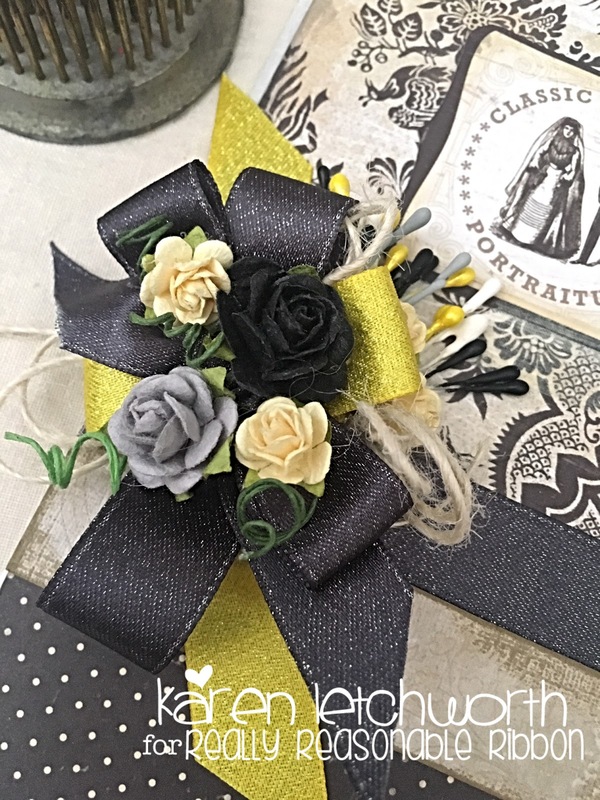 As we do each month, my teammates and I are sharing projects made with this month's GORGEOUS Ribbon Club Assortment. Take a look at these amazing trims. 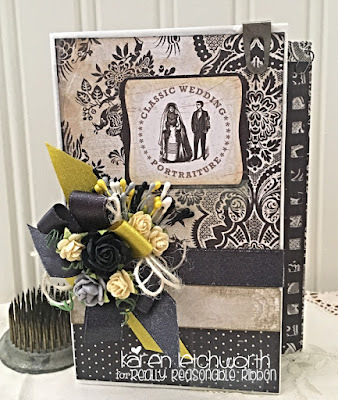 So, for today's Blog Hop I decided to make a Mini Bridal Album. It's a great little gift to give a bride-to-be, or brand new bride.....or even, a "older" bride like me. Just a super cute place to display a few small wedding photos. As I often like to do, I used glassine bags to create this little album. I love that by using bags and envelopes, you get natural "pockets" for tucking in photos, etc. 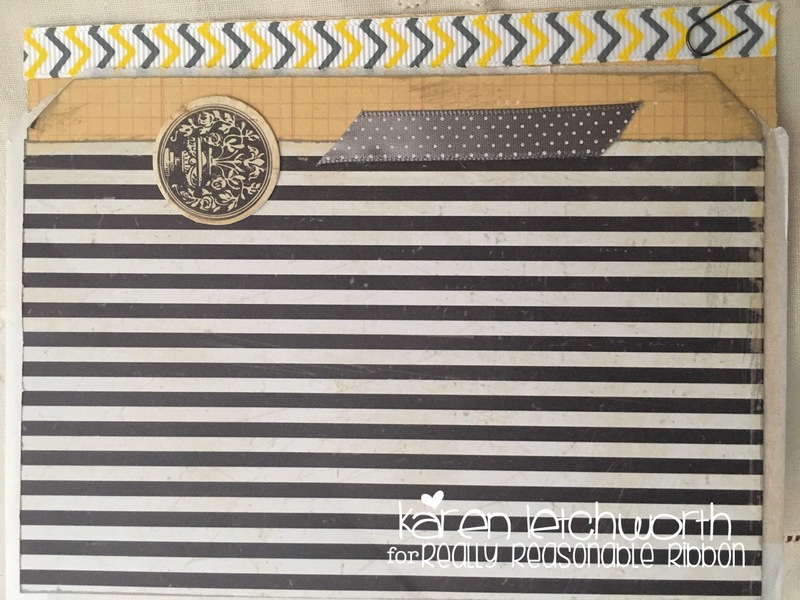 I added a photo mat/journaling card that you will see sticking out of the back pocket of my little album. 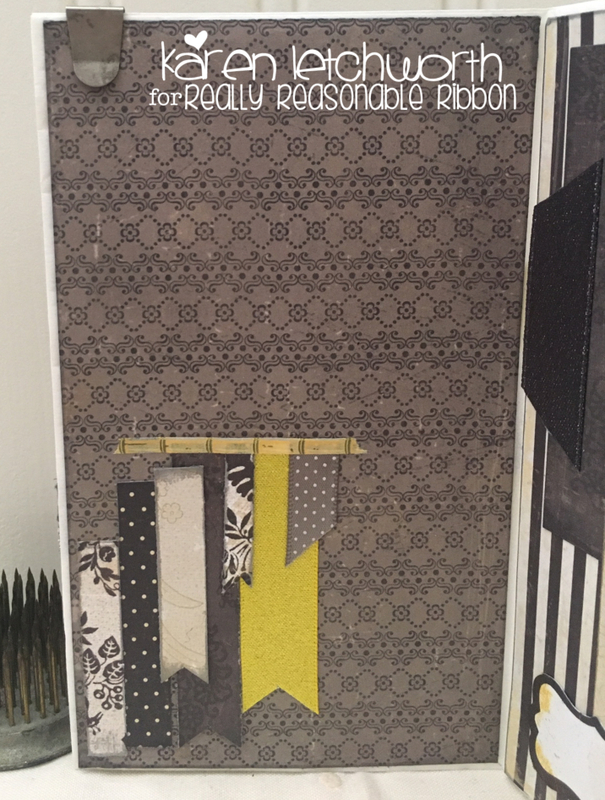 The album was created using a Crate Paper line called Portrait; and it matched this month's Ribbon Club Assortment so nicely (as the RRR assortments always seem to do with all the lines I use). On the cover of my album, I used an ephemera piece from this Portrait line by Crate Paper as my "title" per say. Next, you will see that big beautiful bow made with lengths of 5/8" Charcoal Shimmer Satin, 5/8" Daffodil Shimmer Satin, Ivory Burlap String, and it's topped with some lovely 10mm Yellow Open End Roses, 15mm Parma Gray Open End Roses, and a 20mm Black Open End Rose. 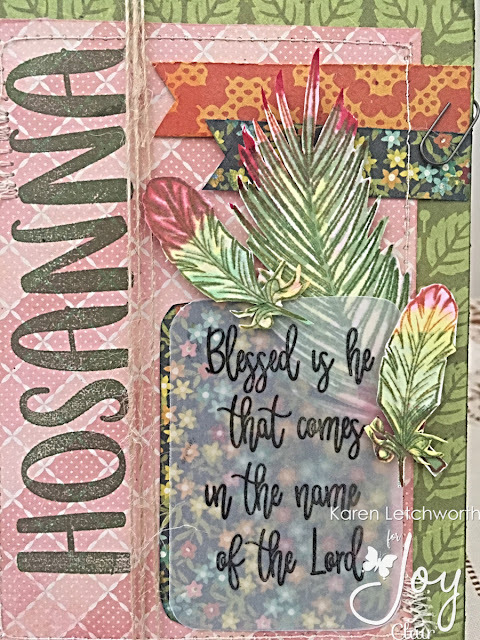 Above you will see the first inside page (left) where I simply added a few strips of patterned papers and a few trims, including the 5/8" Daffodil Shimmer Satin and 3/8" Metal Gray Satin Swiss Mini Dots, to create the banners/flags as a border at the bottom left of this page. I also added a small piece of washi tape just above the papers/ribbons to secure them for the long run. RRR has lots of great Adhesives such as Score-Tape and 3-D Foam Tabs, to help you really hold together your treasured projects. I use Really Reasonable Ribbon's Adhesives all the time on my projects. They're awesome! This next page, which is the inside right (Page 2) is covered with the same patterned papers using pieces of Score-Tape and I also added a small pieces of the 5/8" Charcoal Shimmer Satin, and 5/8" Daffodil Shimmer Satin, just as a small touch of color and texture. You can also see my photo mat sticking out of the pocket (to the right). I didn't pull this all the way out to photograph it (because I'm lazy) but I'll list all the trims I used. This final photo is the back cover of my Mini Wedding Glassine Bag Album. 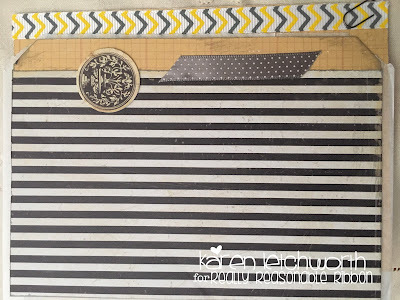 I added a small piece of the 3/8" Metal Gray Satin Swiss Mini Dots, and you can also see the back side of my "tucked inside the pocket" photo mat peeking out to reveal a length of the 3/8" Yellow/Gray Chevron Stripes Grosgrain Ribbon and a tiny rusty paperclip. That's about it. Your next stop on this hop will be at Kathy's Blog. 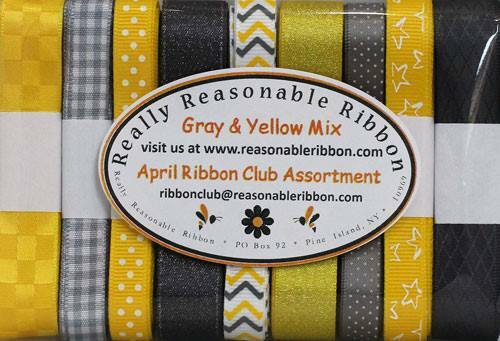 Don't forget to leave comments along the way, and then answer the final question on the RRR Blog so that you'll be entered to win this month's Ribbon Club Assortment. Pretty....pretty......PRETTY!!! 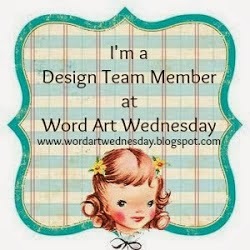 Hello, all my sweet and talented blog friends! 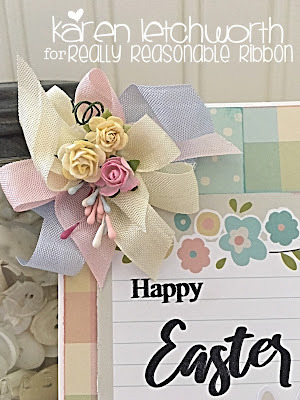 I'm so glad that you've chosen to stop by because I'm sharing an extra sweet Easter card that I created for Really Reasonable Ribbon. Everything I create using the fabulous ribbons, trims, flowers and more from Really Reasonable Ribbon do SO much to make my cards extra special. 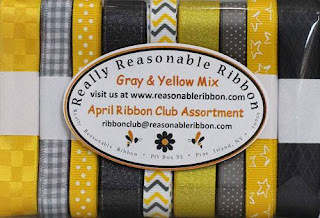 There's always a perfect trim, flower or embellishment for every project at Really Reasonable Ribbon. I hope that you will stop by often. Have a blessed week! Hello, all my creative friends! 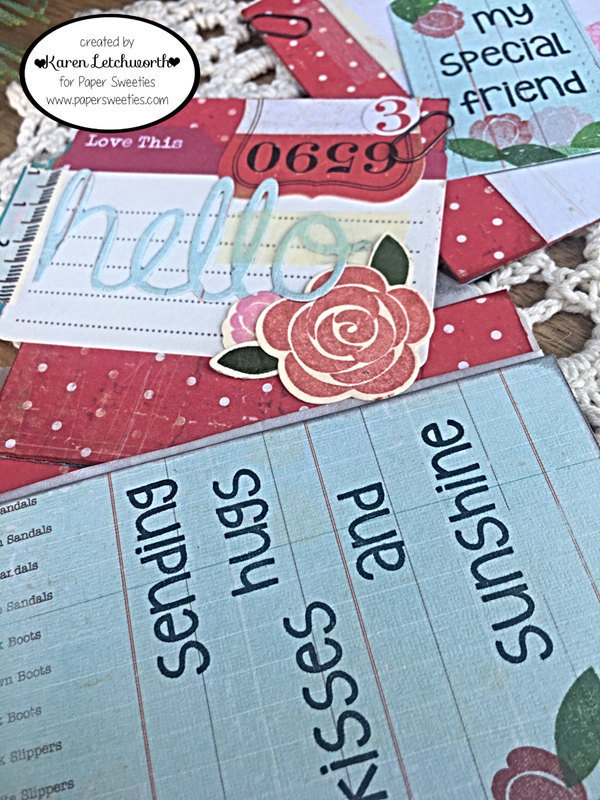 Welcome by today as I post a really fun project I created for Joy Clair Stamps along with our friends, and partners this month, at the Cutting Cafe. We have combined some of the amazing files from The Cutting Cafe with Joy Clair Stamps this month to cross-promote and showcase both company's fabulous products. I had a lot of fun making my projects. Today I'm sharing my version of a Cutting Cafe cutting file called Pie Slice Template and it is almost as delicious as an actual piece of pie. Now, I'll be honest here...there's no pie inside this box. Instead, I filled it with some little candies. Once I had the file printed, cut, folded and taped together, I used some Crate Paper patterned papers and chipboard to adorn the pie box. 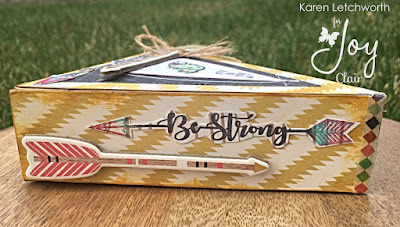 I used several of the arrows from the Inspirational Arrows Stamp Set from Joy Clair Stamps. 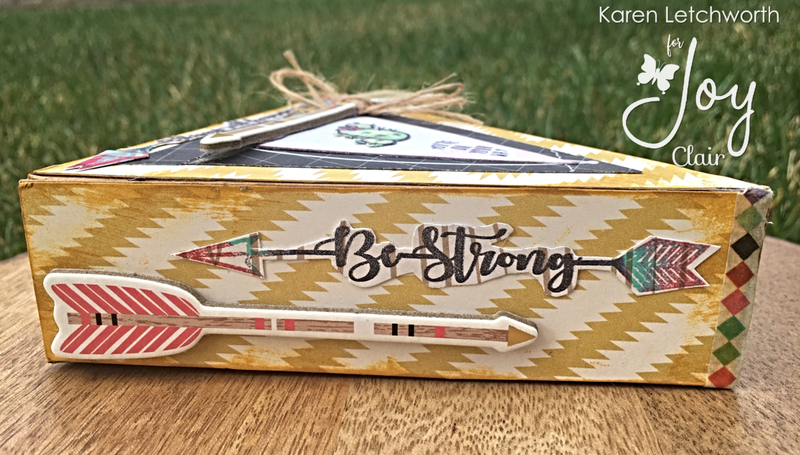 I added some chipboard arrows as well as the stamped arrows, and I wrapped some natural burlap string around the chipboard arrow on top. I stamped the feather (twice on the side of the pie box) using the feather found in the Unashamed Stamp Set. 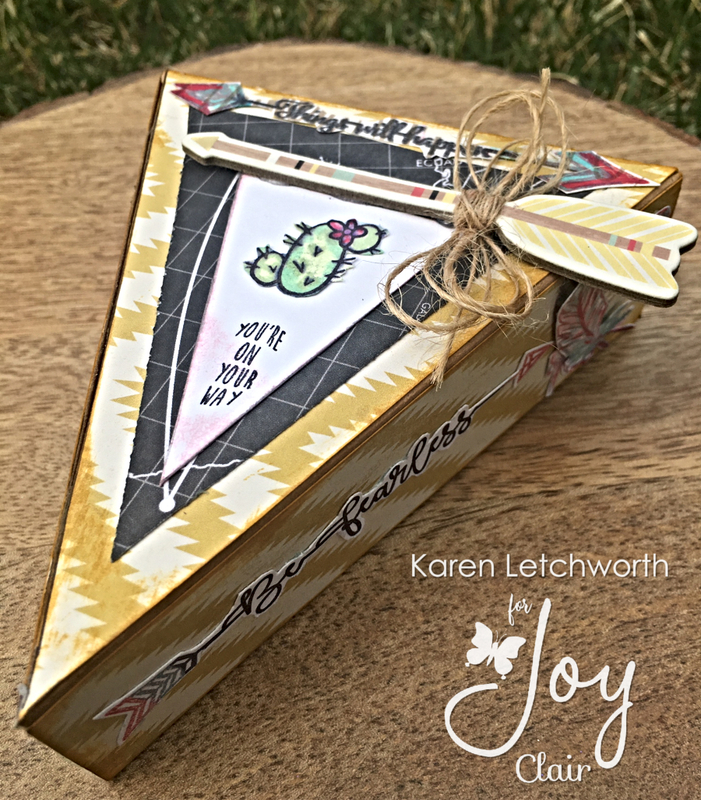 I also stamped the top of the box (the smaller triangle on the Pie Slice Template) using a sentiment (You're On Your Way) from the Going Places Stamp Set, and the cactus found in the Blossom Stamp Set. You can see how everything works together so well, and how all the different sets compliment one another. 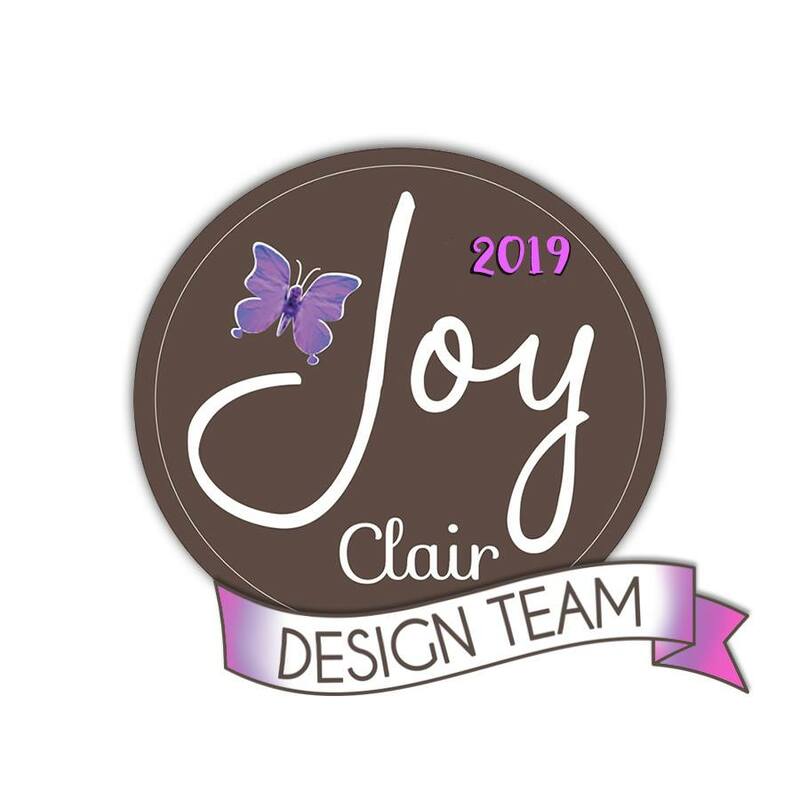 Be sure to stop by both Joy Clair Stamps as well as The Cutting Cafe to see all the fabulous projects being shared this month by all the Design Team Members from both teams. That's LOTS of great inspiration. 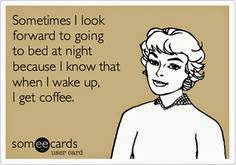 And, you'll be sure to find something that excites you and gives you some great new ideas.